According to the Russian Investigative Committee, the defendant is a 51-year-old man who received an Estonian residency permit and failed to disclose it to the Federal Migration Service. The first criminal case has been filed under a new law requiring Russians with dual citizenship to disclose their status to the federal authorities. The defendant is a 51-year-old resident of the Leningrad Region who received an Estonian residency permit in 2011, then two years later received permanent alien (non-citizen) status in Estonia. According to the Russian Investigative Committee, he failed to report his status to the Federal Migration Service (FMS). The Investigative Committee reports that the Russian citizen traveled to Russia in September 2014 but failed to submit written notice concerning his Estonian residency permit to the FMS. When he attempted to leave Russia for Estonia through the border town of Ivangorod, he was detained by the Federal Security Service. Now the Russian citizen will face a penalty of up to 200,000 rubles ($3,700) or up to 400 hours of compulsory labor. Russia’s law on dual citizenship entered into force on August 4, 2014. It requires all Russians with dual citizenship or other documents that entitle them to live permanently in another country to disclose this to the FMS. Russians who possessed dual citizenship or a permanent residency permit at the time the law entered into effect were required to report it by Oct. 4. At the beginning of December, sources at the State Duma told the media that so far 43,000 people had been fined for failure to disclose their dual citizenship. 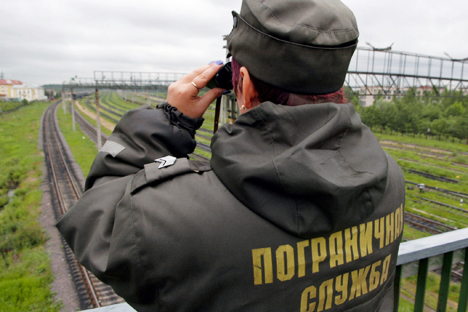 The fines ranged from 500 to 1,000 rubles ($9-18). The sources did not indicate whether criminal cases had been filed against any offenders.